The Kindle Oasis is getting all the attention today, but it's not the only Amazon hardware leak. There's also the upcoming basic Kindle "Woody", and now new benchmarks have leaked which point to a new Fire tablet. According to the GFX database, the new Fire tablet is an update or replacement for the Fire HD8. It has the same screen resolution (1280 x 800), but features a slightly faster CPU than the model launched last September. 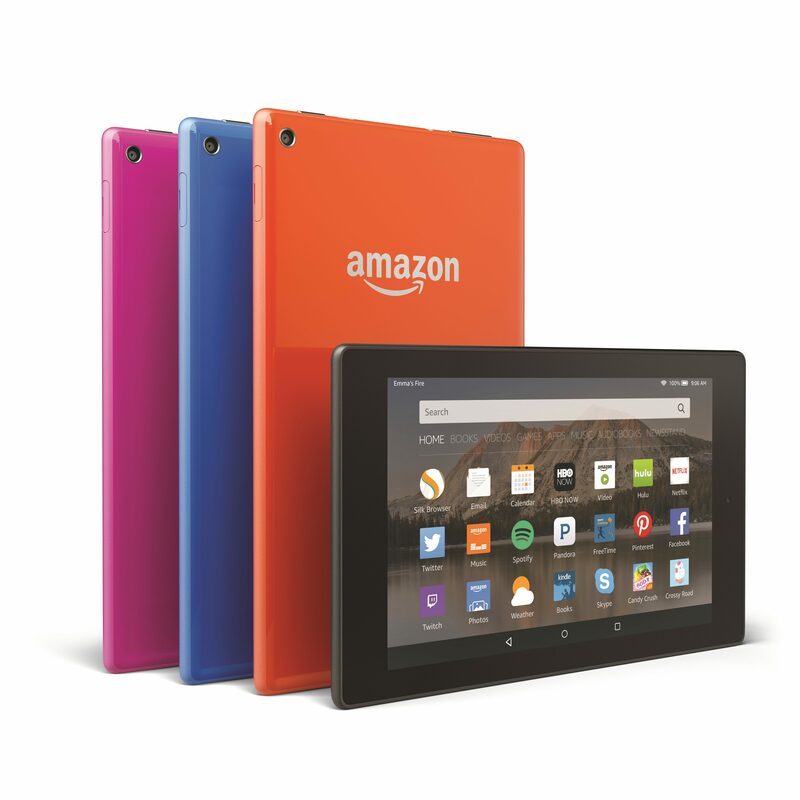 The new tablet runs Amazon's version of Android 5.1.1 on a quad-core 1.3Ghz MediaTek MT8163 CPU with a Mali-T720, 1.3GB RAM, and 4.5GB internal storage. 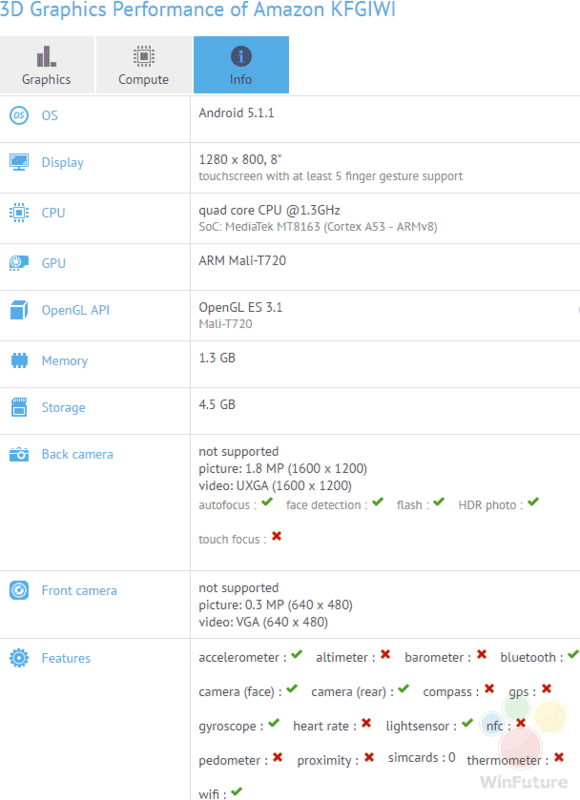 It has a Wifi, Bluetooth, a bevy of sensors, and two cameras (VGA and 1.8MP). Those are weaker cameras than can be found on the current model, so I can't recommend that you upgrade. In fact, this techie would suggest getting the older model. The CPU isn't that much weaker, and what with the better cameras I think last year's Fire HD 8 is the better buy. Nate, the link in the fragment, “…slightly faster CPU than the model ‘launched’ last September” is not the proper link. Regarding cameras, do people commonly use tablets for photos? I only seen it once happen out in the wild; most people use phones. I use the camera on my tablet, yes. And I fixed the link, thanks. And I’d argue in favor of the faster processor. I bought one of the last generation Fires looking to replace my HDX. I found it sluggish after the latest OS update. After a couple of days it went back in the box and the HDX returned to action. It remains my favorite Fire tablet. A faster CPU could be worth it – if there’s enough of an improvement. But the new Fire tablet’s CPU is only a tiny step up, and it comes at the cost of a huge drop in camera resolution. I don’t think the improvement is worth it. But then again, I have been generally fine with the $50 Fire tablet, which has an even weaker CPU. I can’t see giving up my HDX 7. I like the higher screen res and it still does what I use it for. Now if Amazon give us a new premium hdx model, especially in an 8 incher, I’d be all over that.